We just back from a five-day trip to Amami-Ooshima (an island in the south of Japan). While waiting for 858 photos I took to process, I thought I'd post our 2007 Christmas / 2008 New Year's card (nengajou – 年賀状). 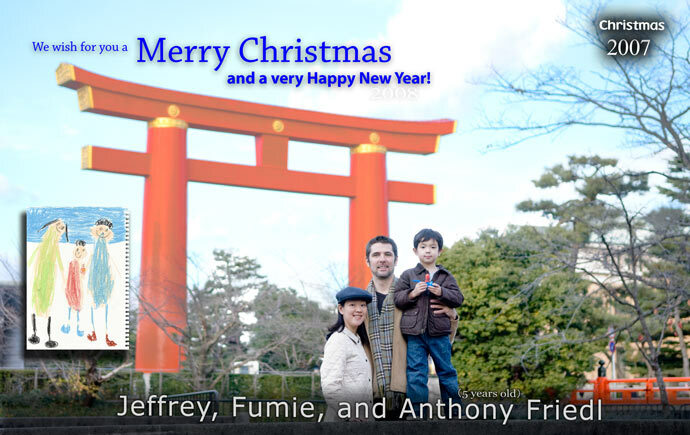 It features a photo we took with a tripod here in Kyoto, and the family picture that Anthony was commissioned to draw. For reference, here is a link to last year's and the year before's, and a short introduction to Japanese New Year's Cards that I wrote a couple of years ago.